Rotting Zombie Portrait lenticulaire décoration de Halloween. pour Halloween. Fête des pères. Sub-Type Decorations. Material Lenticular. Unit Quantity 1. MPN 194418. EAN 5055989233487. Effet holographique Haunted Mansion lenticulaire Halloween décoration cadre photo. Holograhphic lenticulaire photos. Parfait pour décorer la maison sur Halloween. c'est à dire. lieu de travail. Une preuve d'envoi est à elle seule une preuve de réception. Conception d’imprimés lenticulaire. Champ de cris lenticulaire signe 94 cm x 30 cm. Character Evil Scarecrow. Subtype 3D Halloween Decoration. Occasion Halloween. Type Holographic Halloween Decoration. Décoration de Halloween effrayant goule Portrait lenticulaire. pour Halloween. Fête des pères. Sub-Type Decorations. Material Lenticular. Unit Quantity 1. MPN 194419. EAN 5055989233470. Creepy Carnaval lenticulaire signe effrayera les invités à la fête en plus d’un. D’un angle de l’affiche montre un clown menaçant avec drapeaux et un costume de clown tachée de sang et de l’autre, son bogue aux yeux homologue squelettique avec des taux de ramper à l’intérieur de sa cage thoracique. À la fois montré dans l’image, mais cela est pour 1 affiche. Cette affiche en couleur est faite de vinyle léger et facilement attachée au mur et les portes avec 94 x 30cm de hauteur de collant Tack (non fourni). 3D horreur portrait-changing lenticulaire photo-spooky halloween décoration! Ce sinistre signe lenticulaires de chirurgie vous donne plus de raisons d’avoir peur du docteur ! D’un angle, cette décoration en plastique montre une infirmière s’approcher un patient mécontent. De l’autre, une infirmière Zombie administre un coup à un fou masqué ! Il s’agit d’une colonne vertébrale réfrigération ajout à votre thème de la fête ! Dimensions 94 x 29cm que photo montre les deux côtés de l’image, c’est pour 1 affiche uniquement. Seen from one direction it will appear as a colourful and festive sugar skull and from another a sepia coloured skull with swirls. Super cool and mysterious. Features ---Essentials to any party colourful and fun ---Amscan quality product will make great impact on any party ---Great for that special party, don't forget to add on favours and balloons etc to complete the party. ---Check out Amscans amazing Halloween full range of products. ---Includes 1 lenticular sign. ---Approximately 94cm x 29cm in size. ---Features a transforming illustration that shifts from a patient and a nurse to altogether more sinister blood splattered illustration.. ---Perfect for Halloween. ---Please take a look in our shop for more fantastic party items. Scary Ghoul Lenticular Sign. This amazing 3D picture changes as you move your head from a prim Victorian lady to a green ghoul. Sinister Surgery Lenticular Sign. Our Sinister Surgery Lenticular Sign gives you more reasons to be afraid of the doctor! ---Includes 1 lenticular plastic sign decoration. ---Approximately 45cm x 30cm in size. ---Features a transforming illustration that switches from a picture of a cheerful circus entrance to a blood splattered killer clown. ---Perfect for Halloween and fantastic for any sinister celebration. ---Please take a look in our shop for more fantastic items. L'image montre les deux angles du signe, mais vous ne recevra que 1 signe. pour Halloween. Fête des pères. pour la fête des mères. Fête des mères. Conditions & Co. Page d'accueil. pour Saint Valentin. Glaring at you with glowing red eyes from behind the gravestone of Lester N. Rott;. Skeleton & Tombstone Lenticular Sign. Features: ---18" x 12" in size ---Vinyl construction Perfect for Halloween and a fantastic decoration for unsettling even your bravest guests this sinister lenticular picture will look great wherever you use it. 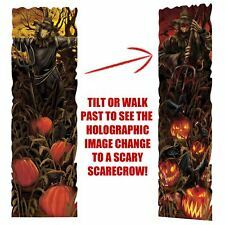 Features: ---37" x 11.5" in size) ---Plastic construction Every decoration features a lenticular surface that shifts between a picture of a gothic field and a monstrous scarecrow. Perfect for Halloween and a fantastic decoration for unsettling even your bravest guests this sinister lenticular picture will look great wherever you use it. Lenticular printing is a technology in which a lenticular lens (the image) is produced which has the ability to change the image when viewed from different angles. In this case, the images are in a brilliant colour palette and design. Features: ---37" x 11.5" in size) ---Plastic construction Every decoration features a lenticular surface that shifts between a picture of the Grim Reaper and a sinister skeleton. Perfect for Halloween and a fantastic decoration for unsettling even your bravest guests this sinister lenticular picture will look great wherever you use it. Features: ---37" x 11.5" in size) ---Plastic construction Every decoration features a lenticular surface that shifts between a picture of desperate people on the run to the terrifying image of putrid zombies grasping hungrily at the viewer. Perfect for Halloween and a fantastic decoration for unsettling even your bravest guests this sinister lenticular picture will look great wherever you use it. Creepy Carnival Lenticular sign will scare the party guests in more ways than one. From one angle the poster shows a menacing clown with flags and a blood stained clown suit, and from another, its bug eyed skeletal counterpart with rates crawling inside its ribcage. Both shown in the image but this is for 1 poster. This full-colour poster is made of lightweight vinyl and easily attached to wall and doors with Sticky Tack (not supplied) Measures 94 x 30cm. Tau Empire. Amscan T-Rex Pinata. Amscan Magical Unicorn Deluxe Pull Pinata charlielewisjoe(1025). Amscan Fancy Dress. Amscan Reindeer Pinata. Amscan Snowman Pinata. Amscan Magical Unicorn Deluxe Pull Pinata. Great for parties it is ideal to hang in a Window or in a Hallway where people will walk past it and watch it look like it is changing before their eyes. Normal scarecrow deadly scarecrow. Lenticular Printed design. This Sinister Surgery Lenticular Sign gives you more reasons to be afraid of the doctor! From one angle this plastic decoration shows a nurse approaching an unhappy patient. From another a Zombie nurse administers a shot to a masked maniac! This is a spine chilling addition to your party theme! Measures 94 x 29cm Picture shows both sides of the image - this is for 1 poster only. Wedding & Anniversary. 6 x Midnight Black Star Hanging Decorations. Image Change Decoration to Look Like a Mansion Painting! for Halloween. Card Weight Boxes. for Christmas. Card Night. Hen Night & Girls Night. Halloween zombie image lenticulaire 45,7 x portrait de pourriture lenticulaire 30,4 cm. Cette étrange image 3D est vos invités par la peur. Anlass Halloween. Taille: 30 x 42 cm. Material Folie. EAN Nicht zutreffend. Victorian Style John Junior 12.5" x 7.5" Horror Hologram scary zombie Picture. Condition is New. Dispatched with Royal Mail 2nd Class. Victorian Style Father O'Brien 6.5" x 8.5" halloween demon Hologram Picture. Condition is New. Dispatched with Royal Mail 2nd Class. Victorian style scary halloween zombie lenticular holographic hologram picture. Condition is New. Dispatched with Royal Mail 2nd Class Large Letter.